Who would have thought anything good would ever come out of Arkansas? And yet here it is - the world's best seasoning combination: Cavender's All Purpose Greek Seasoning. The Mister was in Florida and tasted this on a salad that was served to him. When he complimented the flavor, his host gave him a shaker to take back home. On the back was a phone number and a P.O. box number in Arkansas, so we called up and then sent a check to the company address for 6 containers. Since then, we've been reordering on a regular basis. I hear they are in some superstores now, but I've never seen it around here. If you see it, pick it up for yourself because it is unequivocally the very best tasting seasoning mix that I know. Consistency of dough depends on beer quantity. If too thin, add 1/2 cup more of Bisquick. Roll out dough and cut into bisquit rounds and bake at high temperature. We put in a bit more seasoning and some extra dried oregano. It makes one tasty biscuit and stands up to any hearty stew or soup. Cavender's All Purpose Greek Seasoning - get some. You won't be sorry. There comes a time in everyone's life when you are faced with the a bizarre food item. This can be something homemade (Coffee Jello), mass-produced (Pizza Flavored goldfish crackers), even a beverage (beer and tomato juice) There is the lure of a food that you like combined with something iffy. Not something horrible - if it was horrible, you wouldn't even consider tasting it but by combining it with something not entirely objectionable, it just leaves on unsure as to what to do about it all. And that's where the Soup Lady comes in. As a public service, I have undertaken to put these unusual foods to a taste test. 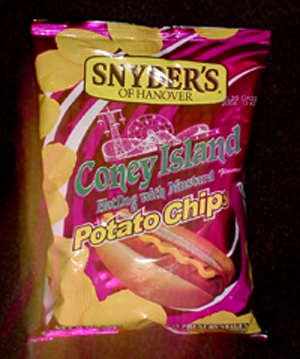 We begin with this: Snyder's Of Hanover Coney Island Hot Dog with Mustard Flavored Potato chips. Now I've tried Salt & Vinegar flavored, Sour Cream & chive flavored - heck, I've even had the ketchup flavored ones (that one was a definate miss), but this is something hard to imagine. Take a minute to think about it: potato chips that taste like a hot dog with mustard. That's what they want you to believe anyway. From the back of the chip package:"Welcome to Coney Island. Take a stroll and enjoy the most mouth watering taste of hot dogs with mustard flavor in this premium potato chip. It's a taste so authentic , you'll almost be able to feel the ocean breeze and hear the sounds of the boardwalk. " Let's just see. The newest member of the Panel of Judges in our test kitchen's Pennsylvania annex was first to try these. She is something of a fussy eater in that anything with dairy or raspberries is an automatic out, but other than that, she's a go. In fact, she's fond of junk food and is always on the lookout for a good mid-afternoon pick-me-up. She prudently started with a gentle sniffing of the open package and pronounced the aroma to be "strange". In appearance, it looks like the standard ruffled chip - veru unremarkable. One cautious bite and the judge went running for water. She pronounced them to be a very strong mustard flavor but overall "bad" and declared she would not put another in her mouth. Well, what kind of taste test is just one bite? So the Soup Lady herself stepped up to the plate. I found the first chip to be a very good imitation of a hot dog but couldn't taste the mustard at all. The second chip had visible yellow patches on it and was indeed quite mustardy. Apparently, the chips themselves are hot dog flavored and mustard flavored powder is sprayed onto them. The flavor combination varied widely from one chip to the next. Just as the taste test was concluding, an impartial passerby strolled near the Test Kitchen Annex and was quickly cast in the role of a tie-breaker. He tasted, mulled it over, tasted again and said: "They're good. I feel like I'm at a cook-out." Very much in the same vein as the blurb on the package back." 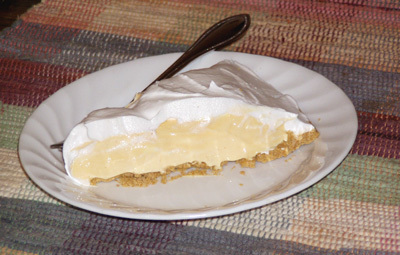 The Fussy Taste-Tester: "I would never eat another one. They were disgusting." The Soup Lady: "This tastes like a hot dog, but not a very good hot dog." A Passerby: "I feel like I'm at a cookout." So - a split decision. You'll just have to try them for yourself.